I feel as if I am on a mission going around the world the quinoa way. Having made it Italian and Indian style, today we head to Mexico. Idea for this recipe came to me as I had an unused jar of Discovery chipotle paste in my cupboard. 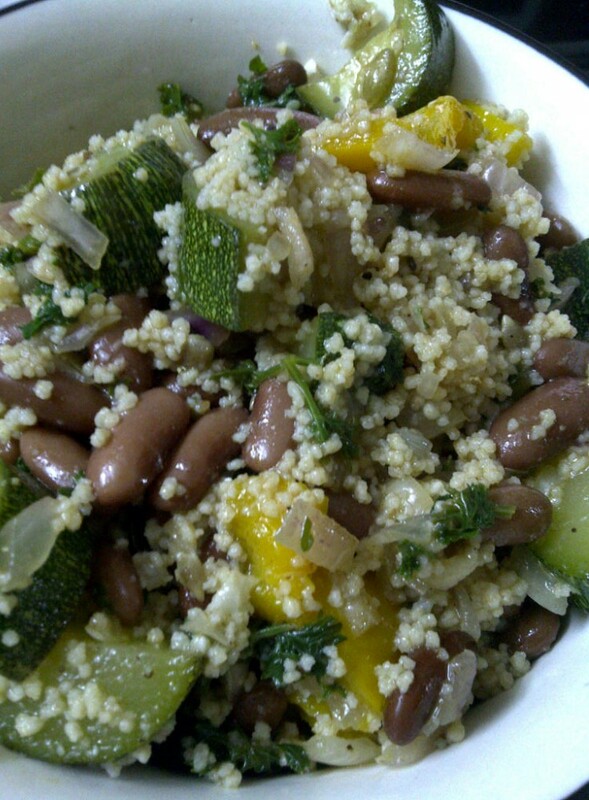 I decided to make use of it in this quick and delicious quinoa recipe. Ideally, should have used green pepper and sweetcorn kernels. However, since I had eaten sweetcorn just the other day, I decided to use yellow pepper and courgette instead (I think courgette is called calabacitas in Mexico). Wanted to garnish with some diced avocado and a dollop of mild yoghurt (instead of sour cream) but the avocados I have at the moment are unripe (seen in photo above) so had to pass. Nevertheless, this recipe is delicious as is. Since courgette is a delicate vegetable and I didn’t want it overly mushy, I cooked quinoa separately and added it towards the end rather than cook everything together. If you don’t have chipotle paste, you can use Mexican seasoning instead. First, cook the quinoa. Bring 1.5 cups of water to boil. Add the stock cube and quinoa, lower the heat, cover and cook for 20 to 25 minutes. Take the cook quinoa off the burner and let it rest. Rinse the kidney beans and add them to the cooked quinoa. Wash, top, tail and dice the courgette. Wash and leave the coriander to dry on some kitchen towel. Heat the oil in a pan. When it turns hot, lower the heat and add the onion, garlic, chilli and salt to taste. Mix well. Cover and cook for 4 minutes. Uncover and add the cherry tomato. Mix well. Uncover and throw in the chopped courgette along with the chipotle paste/seasoning. Mix well. Cover and cook for 7 to 8 minutes. Uncover and add the cooked quinoa and kidney beans. Mix thoroughly and sprinkle the grated cheese on top. Take off the burner and let it rest for 5 more minutes. When you take the lid off, you will see that the cheese has melted beautifully. Whenever I visit my parents, they stock up on all my favourite foods. From healthy fruits and nuts to way-too-indulgent desserts and everything in-between, I am spoilt for choice. One food item which invariably makes an appearance on the list is a tub of Marks & Spencer three bean salad. I am sure that there are plenty of very good variations out there but the Marks one has to be my favourite and my parents know it so make sure it is there to greet me on arrival! Whenever I think of three bean salad, I think of that particular one and all the good family times associated with it. This is my kooky version of the popular bean salad which can be had on the side or as a main course with some rustic bread. Instead of the conventional vinegar dressing, I made some herb dressing with a hint of garlic which pairs very well with the beans and vegetables. Also given my recent love for toasted seeds, I have added some sunflower and pumpkin seeds for texture and aroma. This salad recipe is very adjustable. For instance, I used kidney bean, chickpea and cannellini bean but feel free to use whichever beans you fancy. Same goes for the pepper. I used the yellow variety but you can use red or green, there is no right or wrong way. Having said that, one ingredient which is a must for this is some good quality vinegar. I used cider vinegar; you can try it with simple white vinegar or red or white wine vinegar or even sherry vinegar. Refrigerate any leftover salad, it will taste delicious the next day. Wash the coriander, mint and dill leaves. Bung all the ingredients in a blender or a food processor. Once blended, remove to an air tight container and set aside. 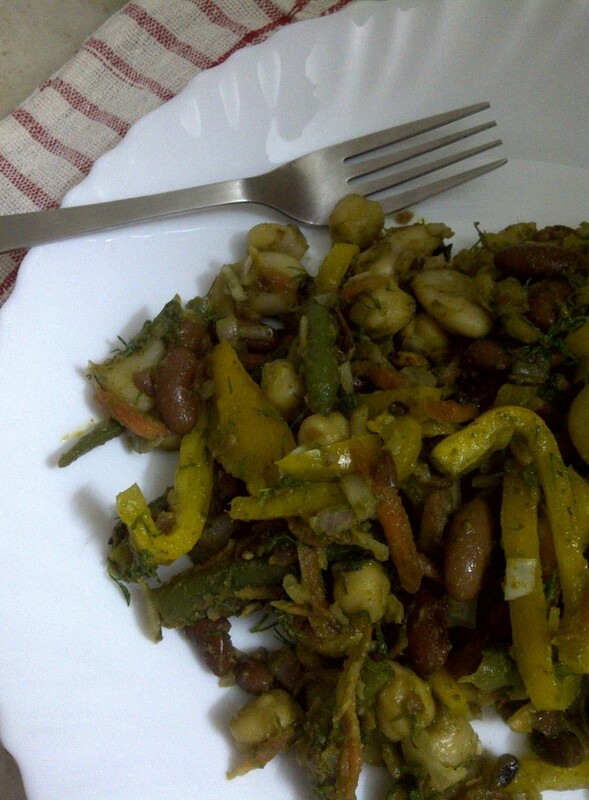 Firstly, you want to marinate the beans and onions in the dressing so that they can absorb the flavour. For this, peel, wash and very finely chop the onions. Add the herby dressing to the boiled beans and chopped onions and set aside for a couple of hours. When you are ready to make the salad, wash, de-core, de-seed and finely slice the pepper. Wash and coarsely grate the carrot. Top, tail and wash the french beans (snap into two if too long) and steam them till just tender. Chop and wash the fresh dill leaves. In a big mixing bowl, combine the beans and onion in herby dressing with the sliced pepper, grated carrots, steamed french beans, chopped dill and toasted seeds. Mix thoroughly so that all the ingredients are coated with the dressing. Have it as is or chill for a while before serving. During the last mixing stage, if you find the quantity of dressing insufficient for the salad, whisk together some olive oil with mustard and pour this over the salad. Firstly, apologies for no proper, plated photo. These cakes had been waiting patiently to be served and by the time their turn came, it was all too hurried so there was no real opportunity. I am new to food blogging and am still trying to get to grips with cooking, serving and photographing, all simultaneously! Yesterday morning, I had boiled amaranth seeds to make these cakes and then came upon this article in Mumbai Boss which extols their virtues; talk about serendipity! My original plan was to make fish cakes using these seeds (substituting the traditional mashed potatoes). But I decided to use kidney beans instead. The end result – most delicious cakes which are very similar to fish cakes in texture, requiring surprisingly very little oil and totally moreish. This recipe does require a bit of patience and advance planning if you are going to soak and boil kidney beans. Amaranth seeds, kidney beans, green peas and spring onions bound together by semolina are very delicate to handle and as you are shallow frying these cakes, you may start wondering if they will ever form a nice crust. But as I discovered, patience pays and if you let them cook for a long time, they will become nice and crunchy on the outside while remaining moist on the inside. This is the second time I have used amaranth seeds in this way. And am feeling much more confident about how to use them in the future. The following makes about 15 to 18 cakes depending on their size. First, prep the kidney beans (if using canned, ignore this step). Soak them for 10 to 12 hours and then boil them in some salted water till they are very soft. 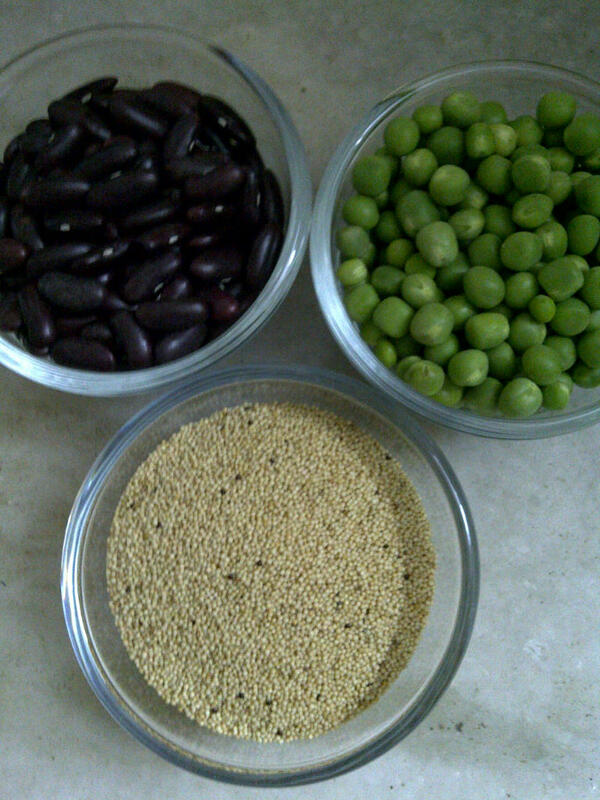 Next, cook the amaranth seeds. I used this website as a guide as to how much water I should use. 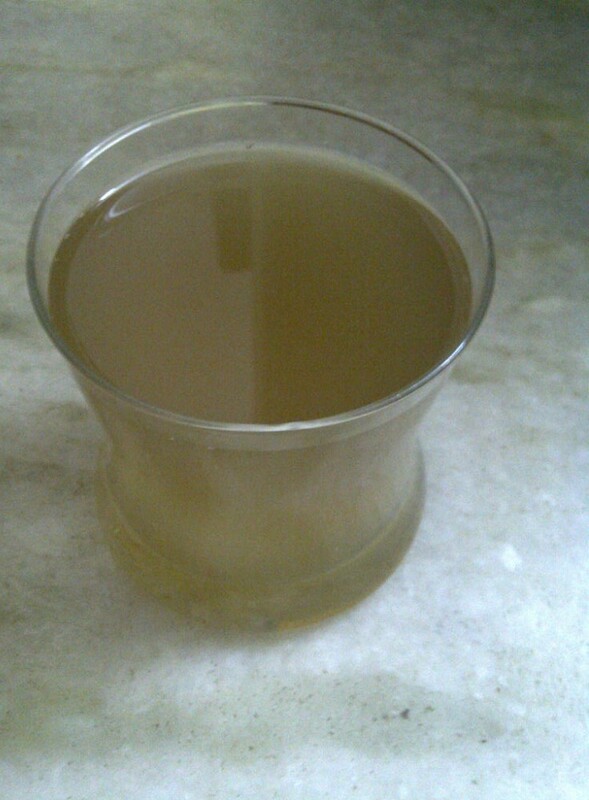 The ratio of 1:3 (1 part amaranth seeds, 3 parts water) works perfectly. So, put the amaranth seeds in a saucepan along with the stock cube and 3 cups of water. 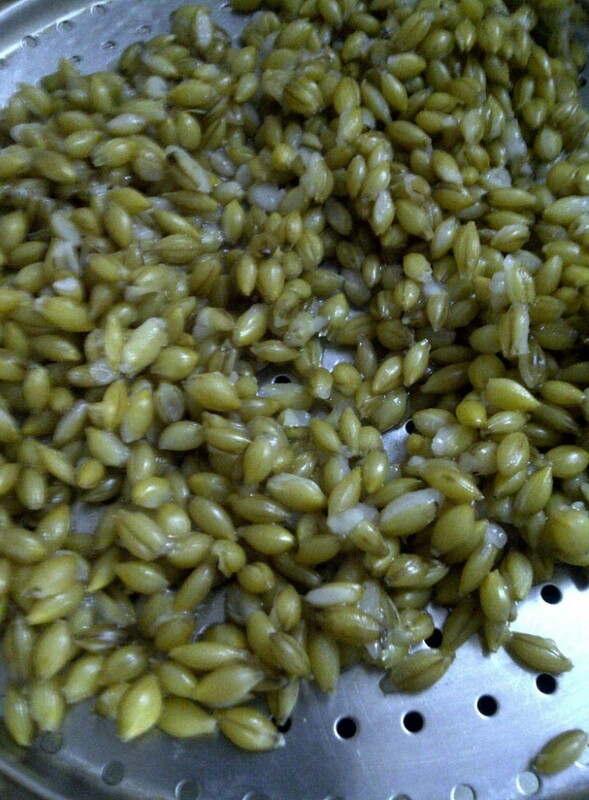 Cover, bring to boil, lower heat and let the seeds cook for 30 minutes. You don’t need to stir. Once the seeds are cooked, take them off the heat. Wash and steam the green peas till tender. Wash and finely dice the spring onions. For this recipe, you only take the white bulb, not the green stalk. Finely chop the red chillies. Pour the semolina in a flat plate. In a big mixing bowl, tip in the boiled kidney beans, amaranth seeds, green peas, chopped spring onion, chillies, sumac and salt to taste. Bring everything together using your hands (it is easier than a spoon). Grease you palms with a few drops of oil and make small cakes of the mixture. Place these cakes in the plate which has semolina. Turn each cake so that it is completely covered in semolina. Once you have shaped all the cakes, put them in the refrigerator for a couple of hours. When you are ready to cook the cakes, remove them from the refrigerator. Dust them with more semolina if you feel the need. I did this and they formed a nice crust. Take a frying pan and grease it with a little bit of oil. You will need to use your judgement as to how much oil you require. I used half a tablespoon and it was more than enough. Heat the oiled frying pan. Once it is hot, very gently place the cakes making sure that they do not touch each other. You will need the space in between them to flip them over. Let the cakes cook on low heat for about 10 minutes before turning them over with a palette knife or a spatula. Cook the other side for 10 minutes. Once again flip them over. Continue cooking each side for 10 minutes till you can see and feel the crust form. Any bits of semolina in the pan will also turn dark brown (as you can see from my photo above). 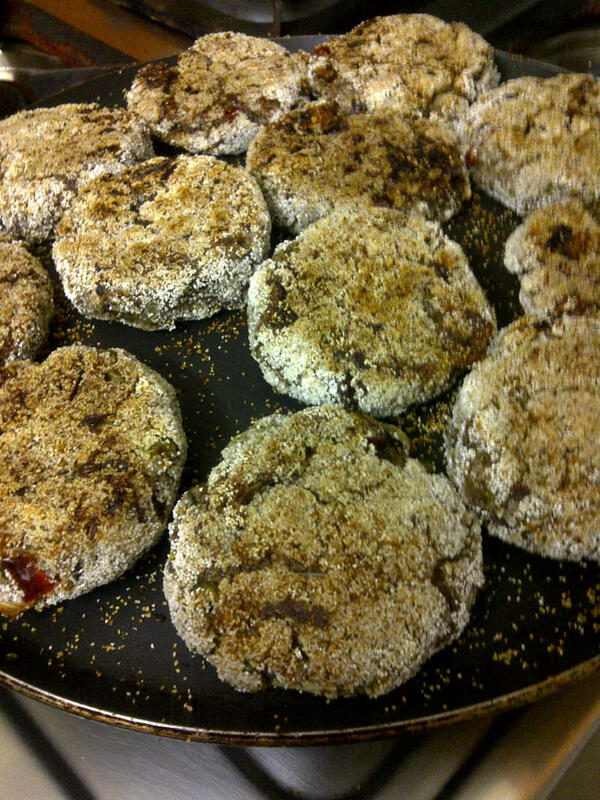 Once the cakes are cooked and the outside is firm and crunchy, transfer them to a serving plate. Serve with tomato ketchup or hot sauce. If you don’t have sumac, you can use the juice of one lime or lemon instead. The uncooked cakes are very soft so be very gentle as to how you handle them when placing them on the frying pan and during cooking (when turning them over). Don’t worry if they break a bit. Once they form the crust, they will become firm. I found the second dusting of semolina (after taking them out of the refrigerator and putting them in a frying pan) helped. 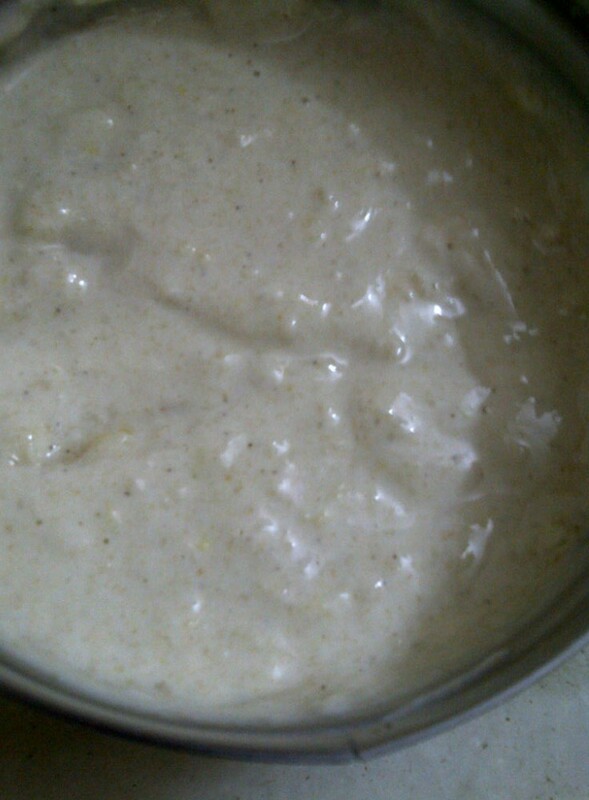 Today’s post is the result of a homemade salad dressing which I wanted to finish. 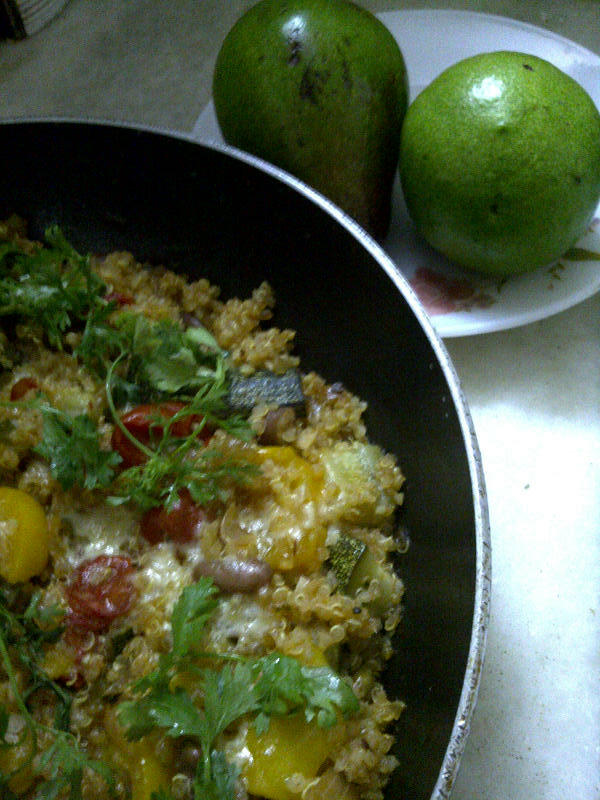 Was trying to think of ways in which it could be used to create a warm dish and this couscous salad is the result. The salad dressing recipe is my sister’s, the kidney beans give this dish a Mexican touch and the vegetable base and seasoning are Mediterranean. 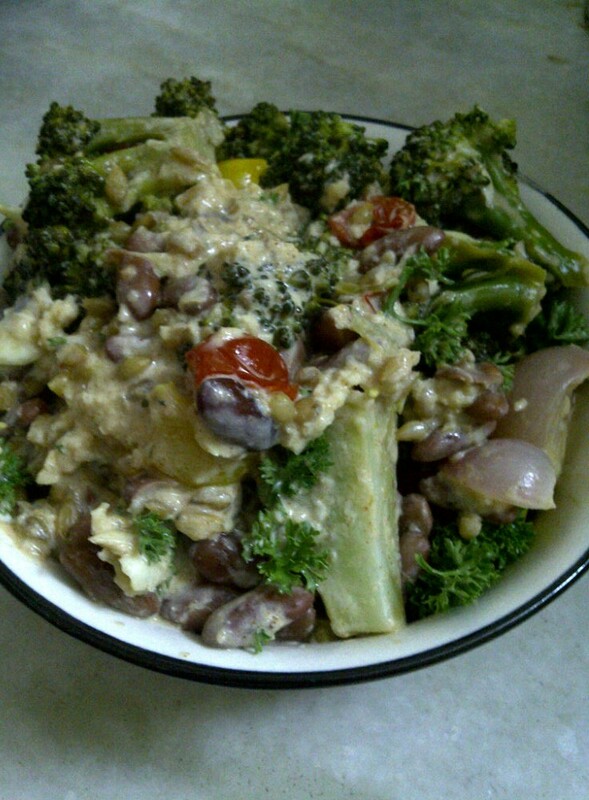 You can adapt this warm salad to whatever you have lying around in terms of vegetables, protein (beans or poultry) and dressing; it is totally flexible. Put all the ingredients in a screw top glass jar. Will stay good in a refrigerator or in a cool environment for up to a week. First, we need to “marinade” the salad base. Add salad dressing to the boiled kidney beans and finely chopped onions. Cover tightly and keep for 4 to 5 hours. Do this in advance so that the flavours develop. When you are ready to prepare the salad, wash and chop the courgette and yellow pepper in medium sized chunks. Heat oil, add the courgette and pepper chunks along with a bit of salt, cover and cook for 5 minutes. Throw in the chopped parsley and seasoning of choice. Mix well, cover and cook for 2 to 3 minutes more. By the end of this cooking time, the vegetables should be cooked but still have a bite to them. You don’t want them too soft or mushy. Leave them covered while you prepare the couscous according to instructions on the packet. Now add the vegetables, couscous, toasted seeds and crumbly cheese to the onion and kidney bean mixture. 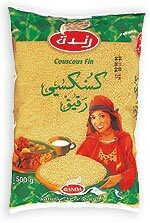 Cook the couscous according to packet instructions. You can add a stock cube to the boiling water for a bit of flavour if you like. I didn’t because I had boiled the kidney beans in chicken stock. 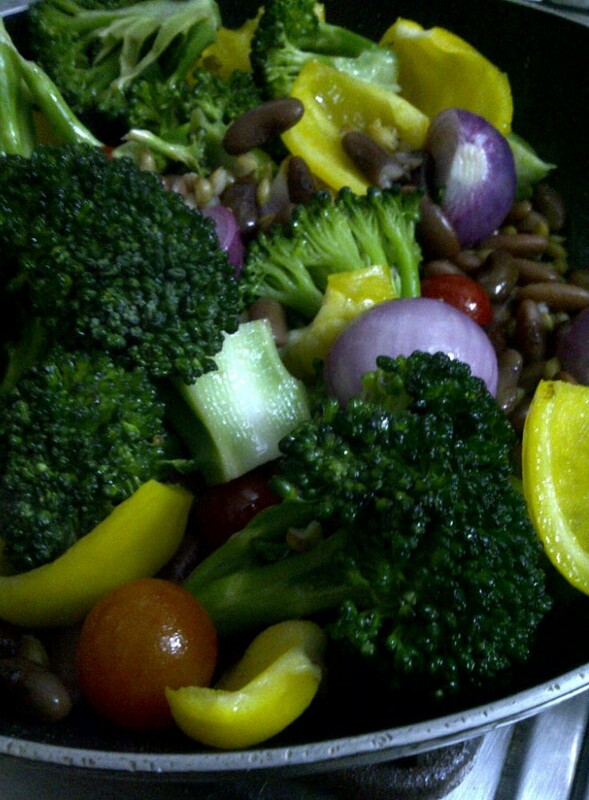 You can use plain olive oil or flavoured oil to cook the vegetables. The choice of seasoning is entirely yours. I used umami paste since I thought it would go well with the other Mediterranean flavours.